Adjust oven racks to highest and middle positions. Preheat oven to 450°. Pierce each potato 8 times with a fork. Place directly on middle oven rack, and bake until tender when pierced with a fork, about 40 minutes. Let stand until cool enough to handle, about 5 minutes. Cut each potato in half lengthwise, and use a small spoon to scoop out inside leaving about 1/4 in. shell all around. 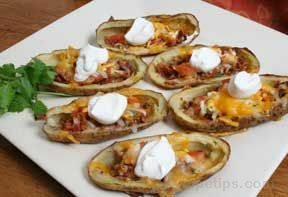 Slice each potato shell in half again. lengthwise to make 16 wedges, and place them on a baking sheet. Combine oil, salt and pepper in a small bowl, brush on all sides of potato wedges. Bake on highest rack until crisp and edges are golden, about 20 min. Season with salt.